75 – 600 persons (15 – 120 m3 / day). The systems are especially designed for small villages and resorts. The systems are delivered fully equipped ready to install. The BioKube Jupiter systems are designed to fulfil either the Standard EU requirements (BOD5 < 25 mg/l, COD < 125 mg/l, SS < 35 mg/l, P < 1,5 mg/l) or the Elite requirements (BOD5 < 10 mg/l, NH4 < 5 mg/l, COD < 75 mg/l, SS < 15 mg/l and P < 1,5 mg/l). The Systems for Standard EU requirements are the cheapest. BioKube Uranus are built extra “heavy duty” and rugged to withstand the strain of being transported to different locations during their normal service life. They are built to fit into a 20' or 40' container. BioKube Uranus will clean to the same cleaning quality as the other BioKube systems. 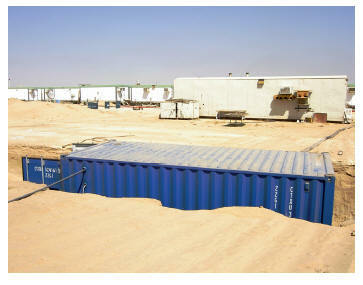 BioKube has delivered 30 of an order for 110 systems to oil installations in the dessert in Kuwait. These systems are equipped with ultra violet lighting, so the water can be safely reused. A standard 20’ container with integrated pre-settlement tank will clean for 50 persons. With external pre settlement tank a 20’ container will clean for 200 PE and a 40’ container for 400 PE. BioKube BioReactor systems are built in sizes ranging from 100 PE to 8.000 PE (15 – 4.000 m3 waste water pr day). BioKube BioReactor systems are delivered as active components (cleaning units) that are installed in locally on site built concrete tanks. BioKube Bioreactor systems are used for larger cities and agricultural production units such as vegetable factories, slaughterhouses and dairies. 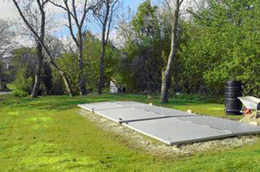 BioKube BioReactor systems will clean wastewater to the same cleaning quality as the other BioKube systems. For systems larger than 10 m3/day BioKube systems are individually designed and built according to the specific requirements for the individual installation. 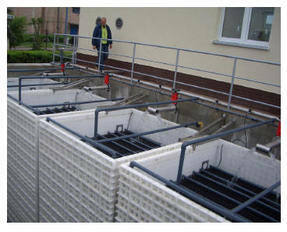 The systems are however all based on the same basic technology of submerged aerated filters. The only real difference between the different sizes being the size of the tank containing the BioBlocks. More sewage water requires more bacteria and therefore bigger BioBlocks.